GMC debuted the 2015 GMC Canyon at the 2014 NAIAS this week. GMC couldn’t wait for Monday to come around, revealing the 2015 GMC Canyon mid-size truck on Sunday. The Canyon will join the already-announced 2015 Chevrolet Colorado as part of General Motors’ efforts to redefine not only the mid-size pickup class, but the pickup truck segment as a whole. 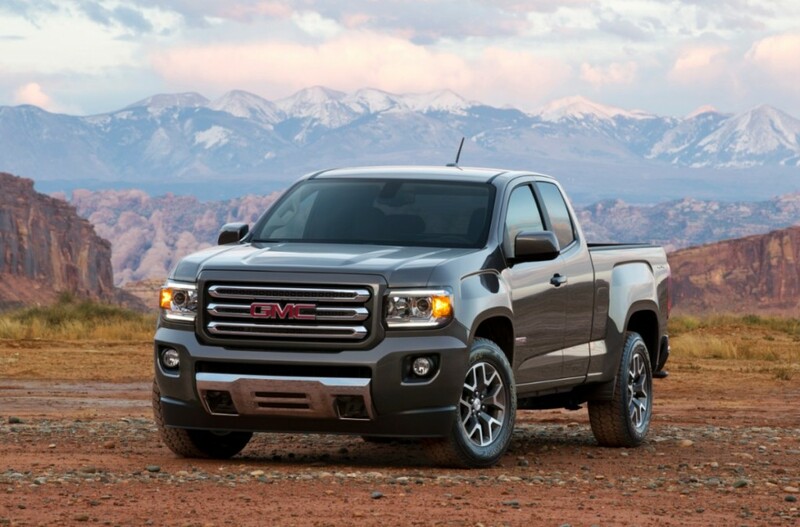 The 2015 GMC Canyon will offer the best horsepower (192 or 302 hp, depending on engine), best payload (minimum 1,450 pounds), and best maximum trailering rating (at least 6,700 pounds). Like its sibling Colorado, the 2015 Canyon will offer a standard 2.5-liter I-4 and an optional 3.6-liter V6; furthermore, a Duramax 2.8-liter turbodiesel will become available in the Canyon’s second year. During Sunday’s remarks, newly-appointed General Motors CEO, Mary Barra, said that the 2015 GMC Canyon and 2015 Chevy Colorado are part of a three-truck strategy that will make GM the only auto manufacturer to offer Light Duty, Heavy Duty, and Midsize trucks. Mark Reuss called Canyon “the mid-size truck that customers have been waiting for,” citing the durability of a fully boxed, high-strength steel frame and the luxury of a highly-refined interior. The 2015 GMC Canyon mid-size truck will also feature OnStar 4G LTE connectivity, which was announced by GM and its brands for 2015 model-year vehicles during last week’s 2014 International Consumer Electronics Show (CES). A full list of the new Canyon’s specs and features can be found in GM’s press release. Mark Skiba is the Internet Sales Manager for the Jeff Schmitt Auto Group. He currently resides in Catawba in Clark County where he also serves as Mayor. At Jeff Schmitt, we provide Buick and GMC vehicles, service and parts to all surrounding areas including Columbus, Westerville, Worthington, Gahanna, and Upper Arlington.